During the 1700s, European armies grew enormously in size. The Seven Years’ War of 1756 – 1763 heightened the trend, and by the end of the Napoleonic Wars field armies had become enormous. Forces of 100,000 or even more, unheard of a century before, were not at all unusual by 1815. The French army introduced the concept of a corps d’armee, a body of infantry, cavalry and artillery plus essential services. The corps could fight alone or in cooperation with other corps, and included all necessary combat and administrative elements. By the end of the Napoleonic wears, all participants had organized their troops into corps, usually made up of varying numbers of divisions and brigades. During the years after 1815, some nations kept their corps structure in place during peacetime, using them to administer recruiting, training and other non-combat functions. This would speed mobilization and keep the staffs employed. The size and composition of corps also became regularized, with each usually having the same number and types of subordinate units. By the middle of the 19th century, an army corps had become defined as the number of troops that could be deployed from a single road in less than two hours: roughly 20,000 men. That rule of thumb had been badly exceeded as extra troops were added: cavalry, engineers, artillerymen, light infantry, medical services, supply columns and more. The Prussian corps organization used in the 1866 Austro-Prussian War had been introduced as part of War Minister Albrecht von Roon’s reforms starting in 1860. In 1859, the Prussian Army mobilized its four army corps for war on the side of Austria against France. The mobilization found many troops untrained, officers of poor quality and supply services either insufficient or non-existent. It also showed just how unwieldy the army’s corps organization would prove in action. The German Confederation, which included both Austria and Prussia along with 36 other german states, had adopted a corps of four divisions. Each division consisted in turn of two or three brigades, each brigade with two regiments of two battalions each plus one of light infantry. All told, a German division would go to war with 10 or 15 battalions, a corps with between 40 and 60. Roon rationalized this organization; in battle, he believed, a general was most efficient with fewer maneuver elements to command. 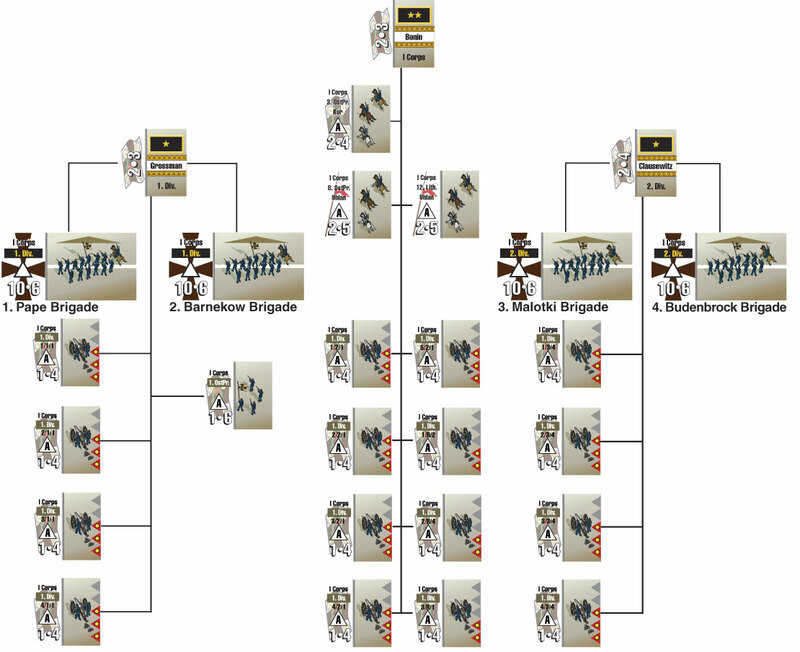 A new-model Prussian infantry corps would have two divisions. Each division in turn had two brigades, and each of them had two regiments. The regiments would be larger, with three battalions rather than the former two, as a regimental colonel was expected to control all three by line of sight. A brigade commander only had to control the two regiments under his command. At the division level, things got more complex. The division controlled two brigades, plus an artillery detachment of four six-gun batteries. These would usually be parceled out to the brigades in action. During peacetime the division was responsible for either a pioneer battalion or a light infantry battalion; during wartime these would be held in the corps reserve. The corps controlled the two infantry divisions, plus attachments of artillery and cavalry. This varied from four to seven batteries (six guns each) and two to five cavalry regiments. Austria also reformed its corps organization in 1860, based on the lessons of the 1859 war. An Austrian corps had included two or three divisions, each in turn of two or three five-battalion brigades. Each brigade included the four field battalions of a single regiment plus a light infantry battalion: usually jägers but in a few cases grenzers (Croatian border troops) or volunteer student battalions. Austrian generals performed poorly in the 1859 war, and the reform commission appointed after the war recommended using fewer of them. In particular, it pointed out that the small brigades made regimental colonels superfluous. A peacetime regiment had contained four field battalions and a grenadier battalion; now they would have three field battalions, a fourth reserve battalion and in wartime a fifth training battalion. 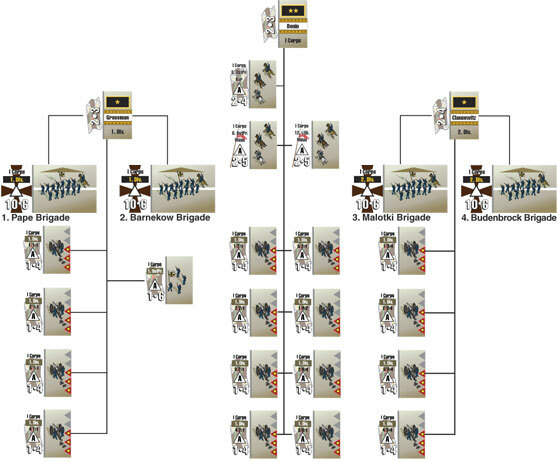 Two of these three-battalion regiments would be grouped in a brigade along with a light infantry battalion and an eight-gun artillery battery. It was a powerful and flexible organization, led by a major general (Austria did not have a “brigadier general” rank and this was the imperial army’s equivalent). The larger brigades required fewer light infantry battalions, allowing the role to be filled exclusively by jägers. The organization became less flexible at the larger echelons. An Austrian corps included four infantry brigades, a cavalry regiment and a brigade-sized artillery reserve as well as engineer, supply and medical units. The new arrangement required fewer general officers, which had been the goal. But handling six maneuver elements proved beyond the capability of most Austrian corps staffs in 1866, and the intermediate stage of division headquarters gave Austria’s Prussian opponents a decided advantage in flexibility and reaction speed. Though the Prussian staff was undoubtedly better organized and more efficient than their Austrian counterparts, their organization also gave them a lighter workload. In Battles of 1866: Frontier Battles the units are infantry brigades, cavalry regiments and artillery batteries, but players maneuver their units by corps. The corps are activated by the army command, or through the initiative of the corps commander. The Prussians generally activate in a much more predictable fashion, and can get all of their units into action thanks to the division commanders. An Austrian corps is much more difficult to handle and often only gets into action piece by piece. Click here to order Battles of 1866: Frontier Battles now.